Review Google just unveiled its Chromecast wireless streaming media dongle on Wednesday, and it's already being hailed by some media outlets as something close to the Holy Grail of internet TV. So does it live up to the hype? Here at The Reg​'s San Francisco annex, however, we've even got that beat. The Chocolate Factory lent us a Chromecast to monkey around with for absolutely nothing, so I took it home and tried it out on my own HD set. Setting up Chromecast couldn't be easier. There isn't even a user manual in the box – just the dongle, a USB cable, a power adapter, an HDMI extension cable, and a note directing you to a Google website for next steps. The dongle looks and feels like a chunky USB drive, only with an HDMI prong instead of a USB one. It's designed to plug directly into your TV's HDMI port, but the short extension cable is provided in case the fit is awkward or Wi-Fi reception is spotty. One thing that may not be clear from Google's marketing materials is that Chromecast needs to be connected to a power source at all times. 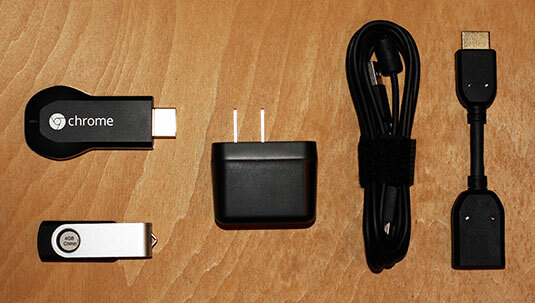 The USB cable is included for this purpose. 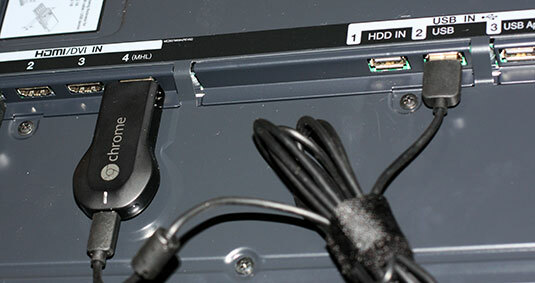 If your TV has USB ports on the back, they should provide enough juice to power the dongle, with all the cables tucked pleasantly out of sight. If it doesn't, an adapter is provided so you can connect directly to the AC mains. That's all the plugging you need to do. Chromecast is Wi-Fi only, so there are no Ethernet cables to worry about, and there are no switches or settings of any kind on the hardware itself. Next, you need to configure the device, which is also a breeze – though you will need a supported device to do it. Remember, Chromecast isn't connected to your Wi-Fi network yet, so you can't set it up with a web browser. You'll need to download a small app for the purpose. So far, setup apps are only available for devices running Android 2.3, iOS 6.0, Windows 7, or Mac OS X 10.7 (or any higher versions of those platforms). Sorry, Linux die-hards! But then again, you'll only need to run the app once to configure the Wi-Fi settings, so limiting the setup to these platforms isn't much of an inconvenience. Once Chromecast is up on your network, it will inform you that it's ready to go with a start screen that displays the current time against a nature-themed background that changes every minute or so. And that's that. Chromecast doesn't have a UI as such. There aren't any settings to configure and it offers no controls with which to select content. You don't even need to enter your account information for streaming services such as Netflix. All of that is handled by the apps on your secondary control device. Just call up the content you want to display on your device, tap or click the "Cast" icon in the app, and the content jumps over to your TV. Google has learned a lot since its failed Nexus Q experiment. That device only worked with a small selection of the latest Android phones and slabs, limiting its appeal considerably. Chromecast, on the other hand, works with a fairly wide range of Android and iOS devices, and with the Chrome browser on Windows, OS X, and the Chromebook Pixel. The catch is that it only works for a limited number of apps on each platform. Right now, that means you can use Chromecast with content from the Google Play, Netflix, and YouTube apps. There's also a Chrome extension that lets your TV mirror your browser window, but that's about it. Next page: Can it do anything else?